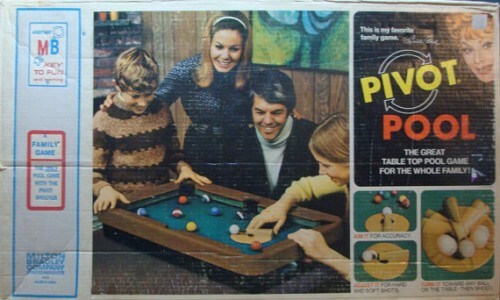 With all the buzz about the Grand MOOC Pivot of Saint Sebastian that word could not help but transport me back to my 1970s youth and the classic game of Pivot Pool (I had this game, but to date, have never had a real pool table). 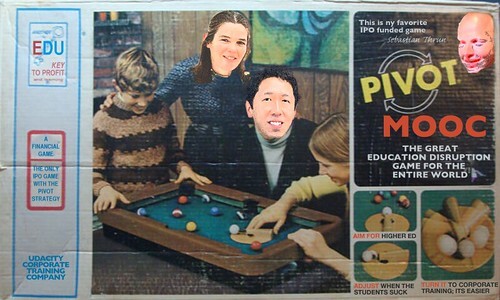 All it took was some swapping out of Lucille Ball for The Great Pivoter, and for fun, the Happy Well Adjusted Coursera family enjoy the game as well. My blending of the MOOCers is not quite in the 1970s tint of the game box. Oh well. Plus a bit of text modifications. Long live the clone brush. Guess who wins this game? I’m guessing that the learners don’t win? Thrun seems able to battle through some of his assumptions about online students but not all. He has bought into the institutional myth of the value of completion. He probably reads every book he starts, too, because no one has ever told him the startling concept that it’s okay to buy a book because you only want/need to read two non-contiguous chapters. Or you want to datamine the endnotes. The pleasure in a MOOC is in picking and choosing what of the class I want to learn. I meet other smart people; I do some interesting assignments which are of value to me and which I may or may not turn in. Turning in assignments is often more about ego or wanting to be seen than any real desire for feedback, and I often don’t have that ego need. I have plenty of college degrees and postgraduate certificates, so I don’t need another degree, I don’t need to finish the class, and I sure as heck don’t need the stress that comes with the pressure to complete. I want to learn what I want to learn at a rate that sustains my interest in the material and my pleasure in the class. It ain’t broke, Thrun, so please don’t try to fix it on my account. I will resist, passively.